Nilgai? What the Hell is That? These guys are very difficult to catch on film. This photo and my info came from http://www.nps.gov/paal/naturescience/animals.htm. I received the text from Deerslayer shortly after 7:00 a.m. He wanted to know if I wanted to get some snapshots of a Nilgai for my blog. It was short and to the point but it spoke volumes. I hadn’t headed out to the hunting camp with Deerslayer on this particular weekend. It’s only about an hour and a half from door to door. Deerslayer headed out after work. Over the past year and a half, he’d decided that one of these creatures would fill the freezer nicely. At 500 to 750 lbs. of lean, flavorful meat, I had to agree. These creatures have been around South Texas since the 1920’s, when the King Ranch imported them from India to keep as exotics and have available for hunters. They are members of the antelope family. The males are sometimes called “blue bulls” because of their coloration. Escaping through breaks in fences and roaming the area without natural predators, the nilgai population has continued to grow in the region. While they are unique looking animals, (not much to look at if you ask me), they are really big and skittish. Getting a glimpse of one is a rarity. I liberally seasoned the meat with salt and pepper mix and seared it in a cast iron skillet with a drizzle of olive oil. There is practically no fat on the meat which means that it can either be prepared quite rare or cooked all day in the oven or on the stove. After letting the meat rest for 15 minutes, I cut the seared tenderloin into bite-sized pieces and served it up as an appetizer to the nine hunters who had gathered around the fire. It was hugely popular. I’m gonna call it a success. 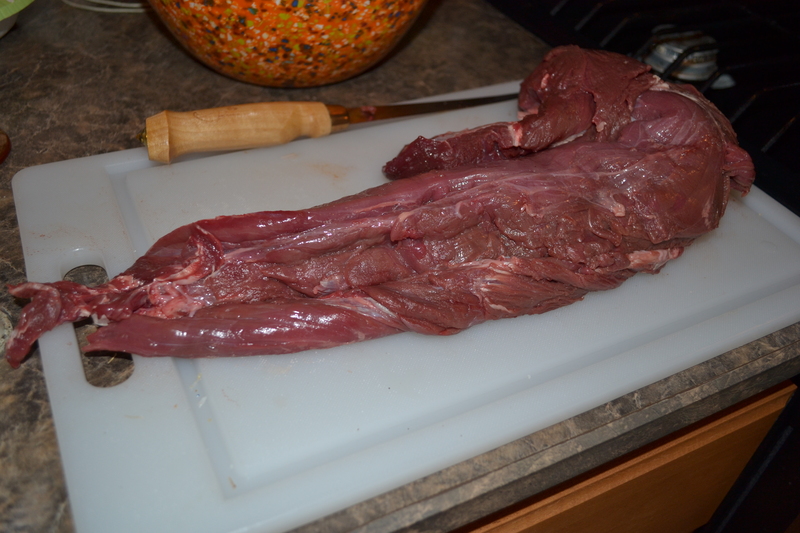 Over the next few weeks, I’ll be learning the nuances of nilgai vs. venison. How will it cook up? How’s the taste? It’s gonna be fun. 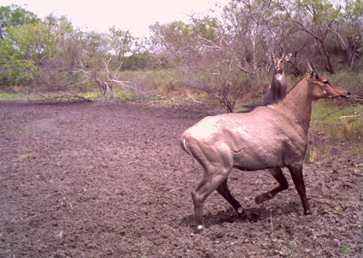 Nilgai sport a jaunty beard and some interesting coloration. This one will be named “Smugly” and will hang in our library. Advance Birthday Wishes to you and good luck in learning the nuances of nilgai vs. venison. I hope you have lots of fun. Have a great week. Thanks. I’ll be having some awesome muffins! True! But lots of mass and tastes great! How did I miss this post!?! Way to go! 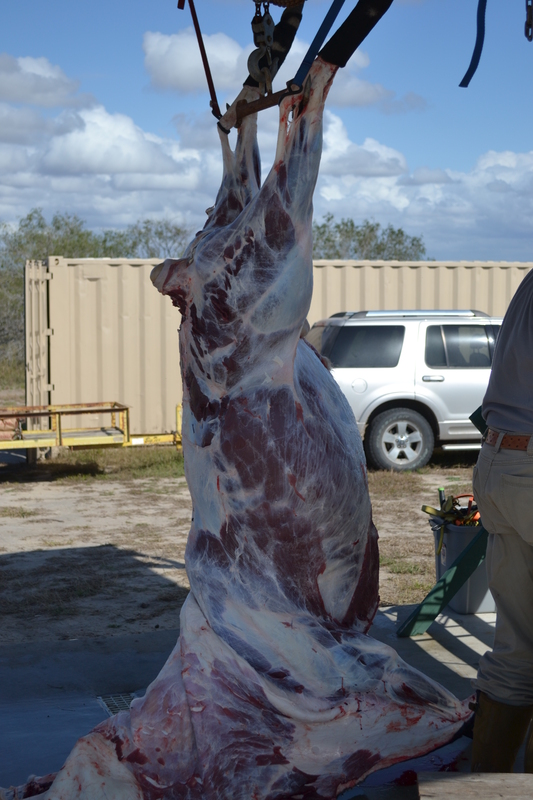 Oh I so want to hunt Nilgai someday. Are you getting a full shoulder mount or a European mount? I hope full because the Euro mounts look like the devil himself! Still cool though. I got a package of Nilgai burger from a coworker and it was tremendous. 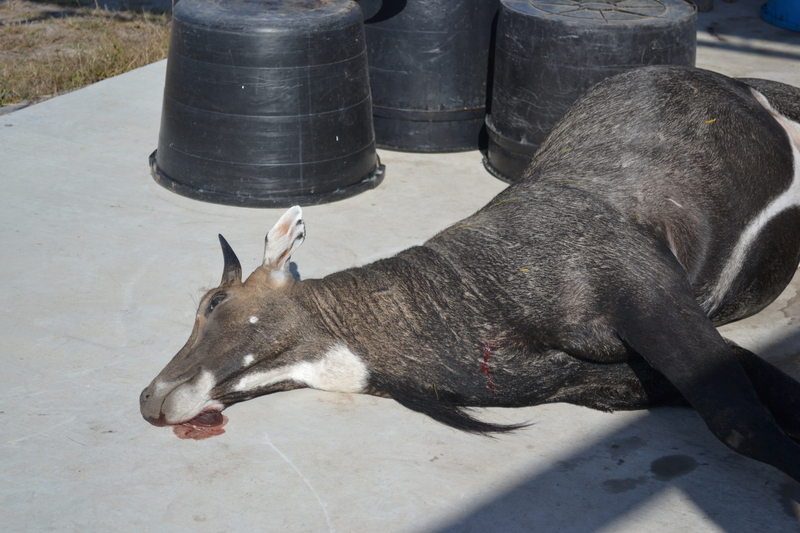 In my books, Nilgai are the number one exotic in Texas. Again, congratulations! Thanks. We’re going full shoulder mount. The cool aspects of the animal are the mane ,beard, and cool stripy coloration on the ears, I’m so impressed with the taste of the meat. A friend gave us some burger, as well. It was done at a professional processor. I believe it was mixed with 20% beef. I, personally, wouldn’t mix. I prefer the lean meat and the flavor. When we mix our own, I’ll report. Wow Mrs Deerslayer! Who knew! For a moment, I thought you went on an African safari or something! That’s very cool. And if anyone can make it taste good, it’s probably you! Thanks. It’s pretty exciting trying something new. I’ll keep you posted.